We’re glad you have all been enjoying our giveaways, especially last week’s, which featured Conan the Barbarian. This week, we’re celebrating the kick-off of one gigantic toy industry convention (Toy Fair) by giving away limited edition posters from another massive convention, San Diego Comic Con! NECA has provided some great Predator posters, and unlike previous giveaways, this time not one but 15 winners will each receive this special edition SDCC 2012 poster! 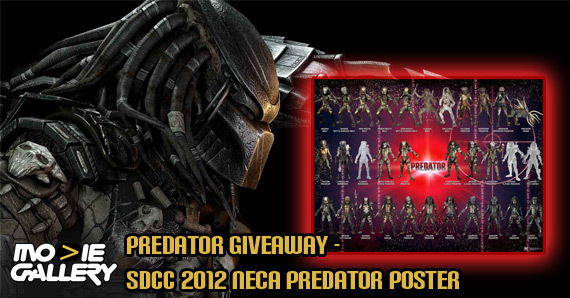 A total of 15 winners will each receive this awesome Predator figure poster. This special edition Predator poster was only available during the 2012 San Diego Comic Con and features every available Predator figure that NECA had ever released up until that date. 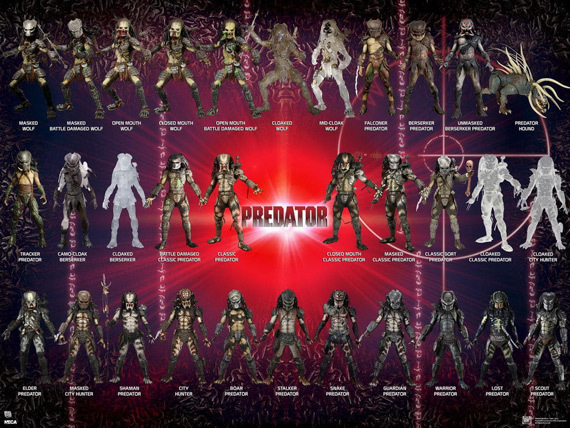 All of your favorites are included in this phenomenal master collection, which contains 32 different figures from the Predators universe. In order to enter this giveaway you must answer the trivia question correctly. If you have Facebook and Twitter you can gain even more entries towards winning. We always like to hear what prizes you would like to see in our future giveaways. Be sure to let us know, and it just might be next! This entry was posted in Contests & Giveaways, The MG Blog and tagged neca, predator, predator giveaway by summerm. Bookmark the permalink.